The Originals Season 2 Blu-ray set is a great presentation of one of prime times great tv shows. Season two quickly expands on the mythology laid out by the first season and raises the stakes. It is a must for any Originals, Vampire Diaries fan, and, it's even great for the casual viewer. 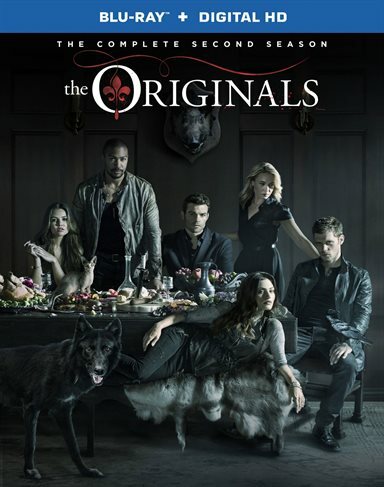 After a very climatic first season finale, The Originals is back for a second season, exploring more of the adventures of the Mikaelson family and their tumultuous inner family relationships. When we last left the Mikaelsons, baby Hope had been born to the family, despite having their enemies trying their best to kill the child. Season 2 of The Originals picks up a couple of months after the Season 1 finale. Rebekah (Claire Holt) is in hiding with baby Hope, Klaus (Joseph Morgan) and Elijah (Daniel Gillies) try to pick up the pieces in their hometown of New Orleans, all while other members of the Mikaelsons have other plans for the family. From the onset, The Originals has set itself apart from the other shows on The CW by providing more adult oriented content; a setting that centers on the value of family and less on stories that involve more trivial plot lines such as what character is sleeping with who. Set in the diverse town of New Orleans, it provides the perfect background for the story to unfold in this unique city that the family now calls home. Since the City itself has a rich history it lends itself beautifully to the old world charm of the Mikaelsons. Along with the exceptional writing team led by Julie Plec (The Vampire Diaries, Containment), the cast truly helps set this show apart from the rest. Just as in the last season, Joseph Morgan and Daniel Gillies are on top of their game as the shows front-runners. They provide depth to their characters, and take the audience on a journey, while they go through their own character arcs this season. Their evilness is so inviting you love and hate them all at the same time. The addition of Yusuf Gatewood, Riley Voelkel, and Maisie Richardson-Sellers as the other Mikaelson family siblings was also a nice added touch that helped display some of the family's more interesting dynamics. As with most of the current television releases by Warner Bros., the picture and sound is top notch. Presented in 1080p AVC the picture is pristine quality. Blacks are deep, which is essential for a show like this one. The colors are crisp and sharp, which adds a nice contract and no artifacting appears to be seen. A vast improvement over the shows original television broadcast quality is presented. The DTS-HD 5.1 Master Audio provides a decent mix of the dialog as well as special effects and background soundtrack. Rounding out the Blu-ray is a nice selection of features, including a look back at Season 2 in The Originals: Always and Forever, which includes interviews with some of the cast, as well as the show's producers, including Julie Plec. The full web series The Originals: The Awakening that provides a great backstory to one of Season 2's major plot-lines focusing on Kol Mikaelson. The 2014 Originals Comic-Con panel, a comical public service announcement, Come Visit Georgia, as well as unaired seasons and a gag reel. The Originals Season 2 Blu-ray set is a great presentation of one of prime times great television shows. Season two quickly expands on the mythology laid out by the first season and raises the stakes. It is a must for any Originals, Vampire Diaries fan, and, it's even great for the casual viewer. If you like all the supernatural movies and TV shows permeating the theaters and airwaves but don't want all of the "skitchiness" presented to younger audiences, The originals gives you a nice blend for a more mature viewer. Download The Originals: The Complete Second Season from the iTunes Store in Digial HD.